The Industrial Fabrics Association International (IFAI) awarded Transformit a 2016 Outstanding Achievement award for a giant H. polylepis. The explanation starts with Zeb. The passion of Zeb Hogan, host of National Geographic Live’s Monster Fish television series, has inspired a traveling exhibition, Monster Fish: In Search of the Last River Giants. While most of the exhibition’s fish are sculpted in traditional materials such as plaster, clay or fiberglass, a giant freshwater stingray (Himantura polylepis) was specified as a lightweight tension fabric sculpture, because of its sheer size (8′ x 15′) and the need to suspend it overhead. 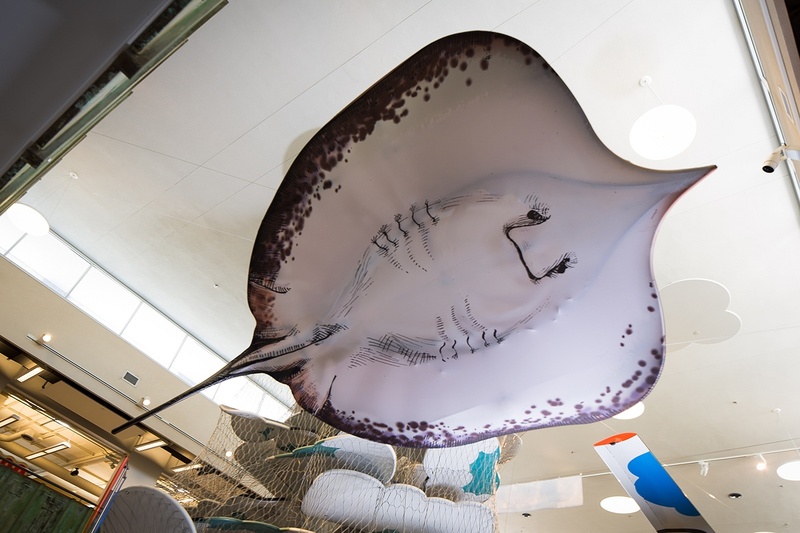 National Geographic’s exhibition designers turned to Transformit to model and fabricate a full-size H. polylepis that met their specifications, among these being it would not weigh 1,300 pounds, or anywhere near that weight, as an actual giant stingray of that size might! National Geographic designers provided sketches of the desired “pose”, and tasked us making a lightweight, transportable replica that would last for years, and that could be installed and dismantled by the exhibition’s staff. 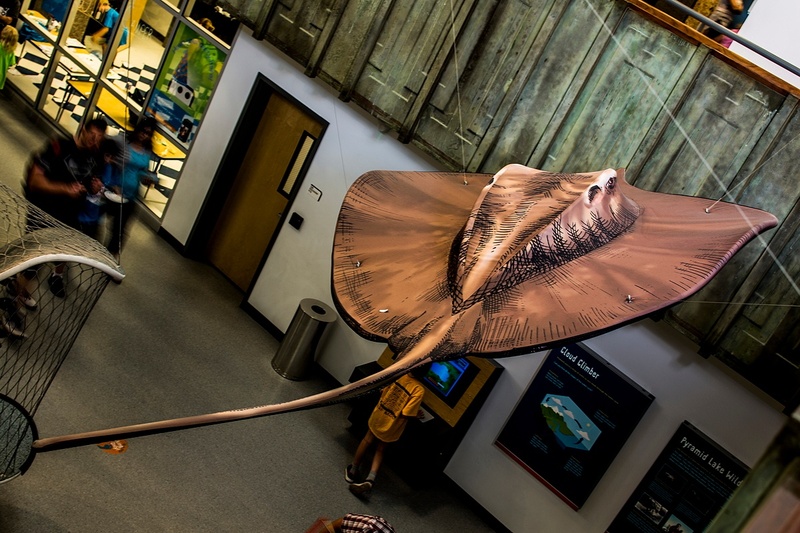 Working with those sketches and photos of giant stingrays, Transformit designer Tom Chabot created a 3-dimensional computer model that respected the subtle curves of the ray. The 3D model was then used to create the drawings of the internal frame structure. 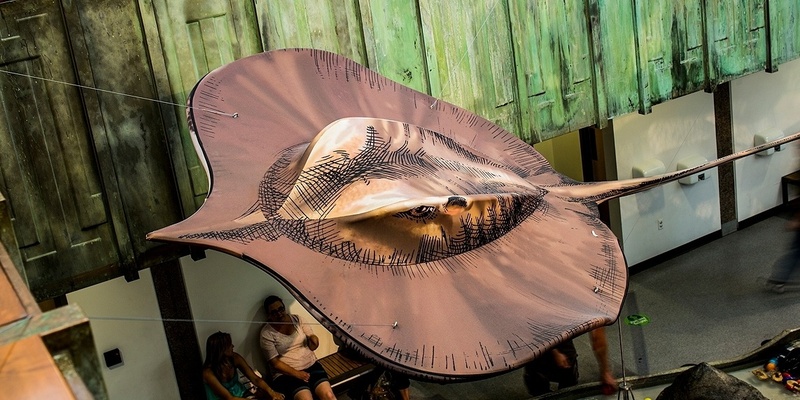 Patterns were made of the numerous fabric panels required to make the stingray’s fabric “skin” and prior to printing, the pattern was proven by making a full-size mockup of the skin. To ensure images of the stingray's skin were correctly positioned and accurately reproduced, we made graphic templates and sent these to National Geographic, who positioned the skin’s graphics on the templates. With the image placements on the templates finalized, the stingray’s skin images were printed by dye sublimation onto stretch fabric. Back at Transformit's shop, the final step was to stitch together the skin’s panels so all graphics matched up nicely—a mistake anywhere on this complex 3D structure would show on the final product. Monster Fish: In Search of the Last River Giants opened in March of 2015 to very positive reviews by National Geographic Society staff, and Zeb Hogan himself, who spoke at the opening party, and in a formal lecture at the National Geographic Museum. First stop on the touring exhibit's itinerary was the Terry Lee Wells Discovery Museum in Reno, NV and currently the exhibit is at the Tennessee Aquarium in Chattanooga, TN. And Transformit's award winning H. polylepis? It weighs less than 30 lbs.